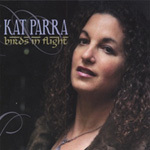 Vocalist Kat Parra’s debut CD Birds in Flight on JazzMa Records is an incredibly diverse collection of songs that showcases her versatile vocal stylings as well as glittering arrangements by award-winning trombonist/arranger Wayne “The Doctor” Wallace and pianist Murray Low. It is an aural feast; seventeen musicians appear here, playing a wide range of instruments to create a spectacular symphony of sounds, colors, and textures which is adroitly led by Parra, who’s opened for Celia Cruz, Charlie Hunter and Cubanismo. Her heartfelt honesty and purity of expression is present in every track, captivating the listener in songs that alternately make you want to get up and dance or sigh with longing. It would be easy to simply call this “Latin” jazz, but this CD transcends that classification. Here we find jazz staples such as Softly as in a Morning Sunrise and Caravan alongside a Sephardic song, three Parra originals, and songs by well-known Latin composers. The disc opens with the infectious samba groove of the popular Brazilian song Mais Que Nada, featuring hip-hop vocals from Parra’s son Pat Parra and an Afro-Cuban groove. Dame la Llave is another grooving number that features a masterful arrangement by John Calloway that highlights the string section and flute-playing of Masaru Koga, as well as a high-flying solo from violinist Anthony Blea. The well-known standard, Softly as in a Morning Sunrise, is transformed here into a Danzón/Cha-cha in an intriguing arrangement by Wallace. The deeply moving Alfonsina y El Mar uses a more intimate group of musicians, featuring the poignant guitar-playing of Rick Vandivier as well as hauntingly beautiful vocals by Parra. The title track, Birds in Flight, is a hard-grooving Salsa that was inspired by Parra’s breakup with her husband at 23, and the eventual triumph of raising two sons on her own. This song was a 1999 prizewinner in the Latin Jazz category of the John Lennon Songwriting Contest. Caravan receives a breathtaking treatment as Parra and Wallace highlight this tune’s Middle-eastern influence with the addition of Michael Spiro on batá drums, Ravi Gutala on tablas, Katja Cooper on dumbek and Paul van Wageningen on drums. The touching �leo de una Mujer con Sombrero, by Cuban composer Silvio Rodriguez, features gorgeous playing from flutist Masaru Koga and pianist Murray Low. 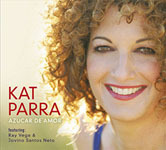 Parra has performed extensively in the San Francisco Bay area, where she is based, and has also toured to New York City, Chile, and Cuba. Her work with the Santa Cruz, CA-based group Charanga Nueve found her opening for legends such as Celia Cruz, Los Van Van, Cubanismo, Las Perlas del Son, and Paulito FJ. She has also opened for Charlie Hunter, and Cold Blood with Lydia Pense, and performed in festivals such as the San José Jazz Festival, the Pacific Jazz Festival (Berkeley, CA), and the Festival de la Primavera (Santiago, Chile). In addition to the John Lennon Songwriting Contest award, she has earned awards from the Columbia College Jazz Festival, Pacific Jazz Festival, Festival de la Uva, and Festival de la Primavera. Although the bulk of her work is in the Latin Jazz genre, Parra is a versatile singer who’s at home in R&B, Motown, blues, Top 40, and jazz. All these influences have shaped her music-making, and within Latin music she also has quite varied interests, singing comfortably in Spanish, Portuguese, Ladino and French. Her focus is on Afro-Cuban, Afro- Peruvian, South American folklore, Sephardic music of the Spanish Jews and some Brazilian music, with a few standards thrown in for good measure. When all of these styles are woven together, a beautiful jazz tapestry emerges that is exciting and inspiring to behold. All About Jazz musician pages are maintained by musicians, publicists and trusted members like you. Interested? 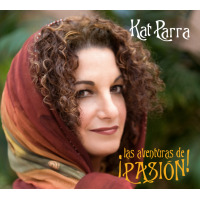 Tell us why you would like to improve the Kat Parra musician page.